Countless studies highlight the importance of eating breakfast. According to the American Dietetic Association, children who eat breakfast perform better in the classroom and on the playground, with better concentration, problem-solving skills, and eye-hand coordination. Enjoying a nutritious start to the day not only improves brain function but prompts less snacking throughout the day – healthy for the brain and the body! Avocado’s nutritional properties help kids and teenagers tackle their school day, unlike sugary cereals that leave kids hungry by mid-morning, the unsaturated fats and fiber in avocados leave you feeling full for longer and they support healthy brain function by promoting blood flow. Our family LOVES avocados. Our favorite way to eat them in the morning is to spread avocado on toast or a bagel for a yummy start to the day. Avocados from Mexico are available year-round so there are always some available to cook with. This week I cooked up a “Green Eggs and Ham” Breakfast sandwich. I toasted some English muffins and fried an egg and a piece of Canadian Bacon in a pan. I put the bacon, egg, a slice of cheese all on top of a few slices of avocado on my English muffin. It was delicious, I can’t believe I didn’t think to take a picture to share with everyone, but the next time I make it I will update this post with one! Cut avocado lengthwise around the pit; twist halves to separate; strike pit with a knife blade and pull to remove; gently scoop out flesh with a spoon; dice avocado (makes about 1 cup) and set aside. In a large skillet over medium-high heat, heat oil. Add onion; cook and stir for 1 minute. Add bell pepper; cook and stir until onion begins to brown, about 3 minutes. Meanwhile, in a bowl, whisk together eggs, cilantro, hot sauce and salt. Add to mixture in skillet along with tortilla chip pieces. Cook and stir gently until eggs are set but still soft. Sprinkle cheese on top. Cover and remove from heat; let stand until cheese begins to melt, about 1 minute. Divide mixture among four plates; top with reserved avocado. Serve with bacon strips or curls, if desired. 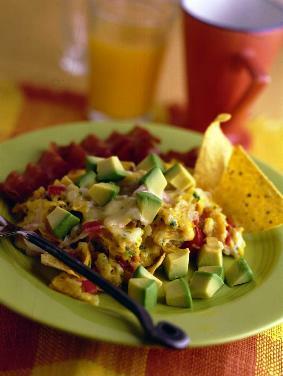 For more recipes, tips or ideas please visit Avocados from Mexico’s website. This product review was made possible by Avocados from Mexico. I was not compensated for this review other than a product sample. All opinions are 100% mine. Hi, Kathy! 🙂 I have awarded you the Stylish Blogger Award (http://www.measuringflower.com/2011/03/stylish-blogger-award.html) for your awesome blog! Do keep up the great work and have a great day! God bless! This sounds so good! I can’t wait to make it, I love anything with avocado’s, but this looks especially delicious. Just finished off an omlette with avacados and tomatoes. Yummy! I’m going to Sunshine market tomorrow. They have avocados at 3/$1. Then I’ll try them for breakfast. Thanks for the tips.